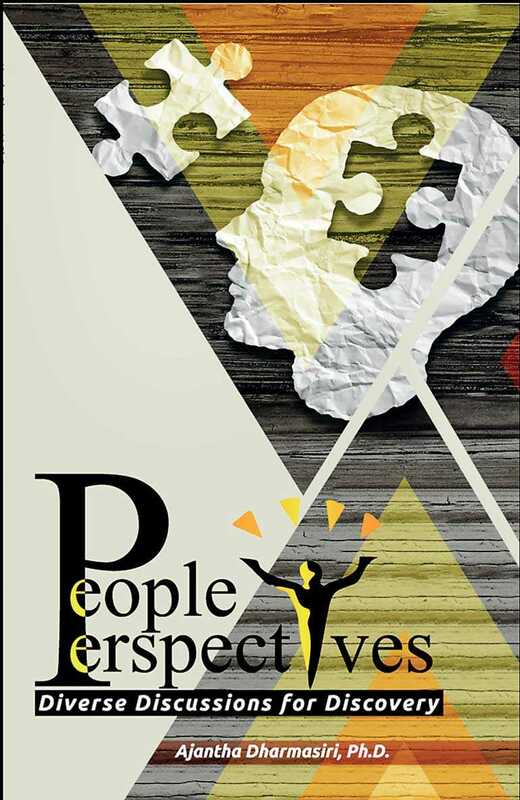 I am so happy to present my seventh book titled, “People Perspectives”. It is a display of diverse discussion for discovery, in fact, my third collection of articles based on the “Humane Results” column published in the Daily FT. Today’s column is about the nature and features of People Perspectives in the context of the socio-economic fabric of Sri Lanka. “I slept and dreamt that life was joy. I awoke and saw that life was service. I acted and behold, service was joy.” This is among the valued utterances of Rabindranath Tagore (1861 -1941). As I mentioned in my preamble to the book, People Perspectives is an assortment of diverse discussions leading to discovering people, the most precious resource in any organisation. Practicing managers have been the centre of focus in such discussions. In the book, I proposed a “four R” approach in getting the best out of People Perspectives. I intended the reading of People Perspectives to give pleasure in meaningful understanding the key concepts and pressure in appropriately applying them. The book contains 25 discussions, each presented as a chapter. Each discussion revolves around people, the most precious resource in any organisation. It is all about people: how they make a difference, not only in their lives but in other’s lives as well. The setting is primarily an organisation, public or private, with wider implications on national and international levels. The term humane typically mean caring, kind, gentle, compassionate, civilised and kind. These definitions all revolve around people. Results, on the other hand is to do with achievement. It could be goals, objectives, targets and measures. When we combine the two terms, the emerging idea is the need to achieve results through people. We have various resources in an organisation. Physical, financial and informational resources will be in no avail, if we do not have the most precious resource. That is the Human Resource. It is the only resource that has life, with associated dynamism and vitality. In such a context, Humane Results (HR) can be the distinct dimension of human resource management (HRM). HRM is constantly evolving. Having started as personnel management, it has come a long way to occupy a prominent place in organisational top levels with strategic human resource management. Among numerous ways of describing HRM, Garry Dessler offers perhaps the simplest. HRM is all about policies, practices and processes of performing the people aspect of a management position. It does not confine to a particular department, division, section or a unit. Every manager has a people role to play. Let’s take the case of an acclaimed accountant. He/she must be very good in the accounting related technical matters. But without managing the people reporting to him/her, the results cannot be achieved. It is a case of knowing the art and science of getting things done through the people, with the people and from the people. That leads to the golden rule in HRM: Every manager is a people manager. Managing people has its promises and pitfalls. Humans have potential and unleashing it has to happen in the organisational setting in order to obtain the desired results. That is the promise. The other side of the coin is the fact that humans are neither rational nor irrational; they are natural, or “a-rational”, if I am to coin a term. There is a high degree of unpredictability in human behaviour. There can be swinging between emotional extremes, be it glad, sad or mad. Managing people is an art and science in that respect. It needs an appeal to head, with structure, direction and control. That is being scientific. It also needs an appeal to the heart, with purpose, passion and positivity. That is being artistic. Hence, a carefully planned set of “head” and “heart” strategies should be on offer. It reminds me of what Lao Tzu said a long time ago: If you want to plan for one year, plant corn. If you want to plan for three years, plant a tree. If you want to plan for ten years, plant people. People development is a long term affair. You cannot rush sunshine. There was a European CEO whom I knew, who used to yell at his senior colleagues, “Where is my EBITDA?” EBITDA stands for Earnings before interests, taxes, depreciation and amortisation. Surely, he should have been interested in that, but the issue was that he was ONLY interested in that. People development went down the drain. The book covers multiple facets of humane results including leadership. As Jim Collins puts it, in his bestselling book, “Good to Great”, we need great leaders with “professional will” and “personal humility” not only at top but at all levels of an organisation. They will inspire, influence and instruct with results in mind. I see a Human Resource issue at the macro level baffling the national leaders. How to pick the right person to the right position, especially with regards to the key ones from a national perspective is essential. We have already seen some displeasure expressed by a section of the public through social media about certain appointments. It is pertinent to mention what David Ogilvy, the advertising tycoon, had to say with respect to hiring: “If each of us hires people who are smaller than we are, we shall become a company of dwarfs, but if each of us hires people who are bigger than we are, we will become a company of giants.” In order to hire people with potential, the hiring process has to be professionally designed and executed. Selection decisions can have far-reaching implications. Hiring is one of the critical people functions of any organisation. In the traditional jargon, it is known as recruitment and selection. Recruitment deals with getting enough applicants as a potential pool. Selection deals with picking the best from the pool. That’s where the matchmaking becomes significant. Leaders should be performers. They practice what they preach. They inspire, influence and instruct in such a manner to initiate result-oriented action. In contrast, laggards are passengers. They hamper the progress by being lazy and lethargic. Indecisiveness resulting in inaction is often common in their approach. Do we see more leaders or laggards? The answer lies in the results they achieve. It is better to light a candle than curse the darkness. Living with leaders and laggards leave us less number of choices for achievement. Leaders have to be far more effective to overcome the ineffectiveness of laggards. Another associated key people aspect is performance. Performance has always been a buzz word in business circles. It matters for both private and public sectors alike. What is performance? The dictionary meaning is that it is the execution or accomplishment of work. Moving beyond, it can also be regarded as achieving a planned set of objectives utilising the available resources in an efficient and effective manner. Performance can happen at three levels in a typical organisation. I would call them triple Is. Individual Level: This is the core where a person should deliver what he/she is expected. Interactive Team Level: This is the spillover from the core. When performing individuals collaborate, the interactive team becomes a performing team. Institutional Level: When such collaborative teams perform, that impacts the organisation. Hence, the institution becomes a performing one. There is one solid “I” needed in order to link the above three Is. That is integration. I have seen individuals getting rewarded for their performance, while the institution is not performing well. Also, the institution may do extremely well, yet depriving the rewards for individual performance. Both these cases highlight the lack of integration. The solution is to have a properly designed performance management system, with the needed inputs from all involved. It is often noted that the status of performance management in Sri Lankan organisations can be further improved and enhanced. From the current state of being a routine custom with less impact on organisational success, it should rapidly evolve to be a critical contributor for organisational progress. The time demands us to act. Knowing clearly should lead s to doing cleverly. It is up to individuals, interactive teams and institutions to make a difference for them as well as for others. This can be seen as the essence with regard to the price and prize of performance. It reminds me of what Seneca, a Roman philosopher (4 BC to 65 AD) said: “Dum inter homines sumus, colamus humanitatem. “(As long as we are among humans, let us be humane.) I earnestly hope that that People Perspectives will assist you towards meaningfully engaging the precious human resources with care and clarity. It is a matter of envisioning the future and endeavouring to make it a reality. The twin challenges of employee wellbeing and enterprise progress can be balanced by ensuring Humane Results. People Perspectives became a reality because of some special people who inspired me to produce it, including my colleagues at the Postgraduate Institute of Management (PIM) and the Institute of Personnel Management (IPM). Being the common “I” of PIM and IPM, it gave me a sense of satisfaction to share my perspectives on people in a broader context. My humble invitation to all the readers is to embark on that journey of excellence.